Miche here. About five days into this second round of vinegar experiments, a thought occurred to me—low bush cranberries keep forever in the fridge. That’s because–oh yeah—I remember this–they are high in benzoic acid, a naturally occurring preservative. Are low bush cranberries, then, a good choice for making vinegar? Well, maybe not. I called Sheila Alexandrovitch, who has a homestead far down the Annie Lake Road 30 kilometres southwest of Whitehorse and asked if she’d ever fermented low bush cranberries. (Sheila is a locally famous for her fermentation knowledge. Her caveat: “I don’t know the science, I just know what works.”) She said, “Oh no. Low bush cranberries actually stop the fermentation process.” Aha! 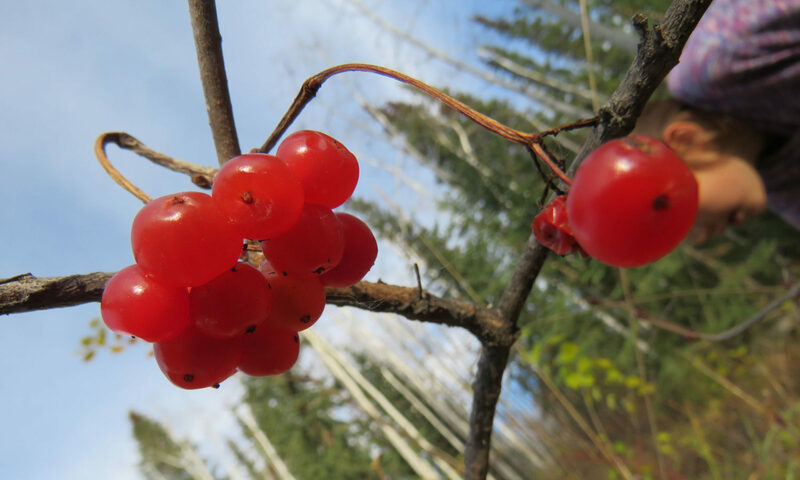 Katherine Belisle, a nutritionist in Whitehorse and another famous fermenter, is on the research, ferreting out whether it’s the benzoic acid or possibly other properties in the low bush cranberry that prevent fermentation. I did a bit of research myself and discovered that berries in general, especially the black raspberry but many indigenous northern berries as well, including the low bush cranberry, are indicated in the prevention of colon cancer. This is great information, and given the rise of colon cancer among women and men in recent years, another good reason to keep eating our berries. Back to the vinegar: liberated by Sheila’s revelation, I ceased to fret about the putative low bush vinegar, strained out the berries (saving them for muffins), decanted the juice into a glass jar, and stored it in the fridge. The very next day, guess who dropped by for a visit, on her way back to Dawson after a trip abroad? Yes, indeed, the very one, Suzanne Crocker. I poured her a glass of the low bush-vinegar-turned-refresher. She liked it. Here’s the recipe, exactly as I made it. Now, here’s the kicker. Just as I finished writing this note, I noticed the sealed Mason jar of low bush cranberry refresher on the counter beside me. I’d left it out all night. Tiny bubbles had formed around the rim, a sign of fermentation. When I opened the lid, it popped. The flavour definitely has a hint of yeast. Calling all fermenters and scientists: What is going on? Was it the juniper berries (suggested by Katherine, because the skin is coated in yeast)? Was it the crab apple sugar (added by me, in uninformed desperation)? Why is this non-fermentable fermenting–maybe? Previous PostPrevious Don’t Judge a Vegetable By Its Cover!